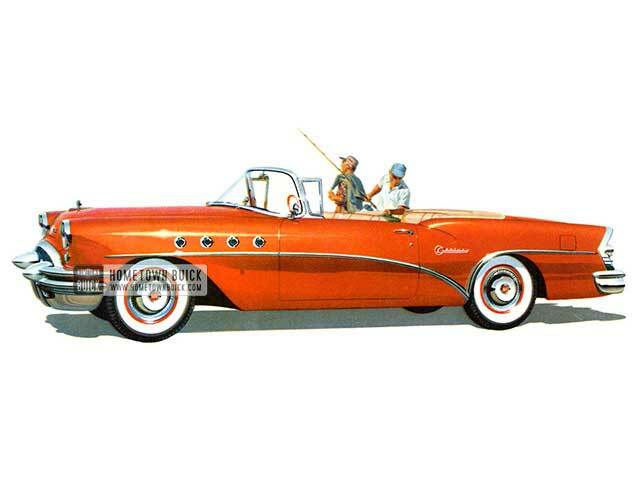 Finest worth in the fine-car field is Roadmaster. 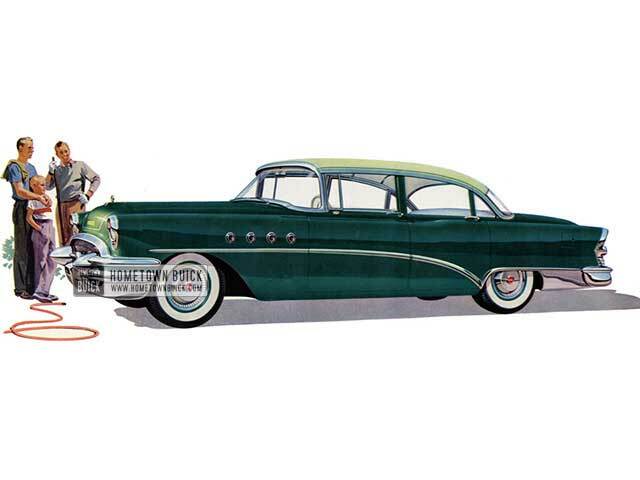 The 236 V8 horsepower 1955 Buick Roadmaster Riviera (Model 76R) for example, has added headroom - yet its exterior styling is lower-profiled with true custom-car flair. Windows and horizontal seat adjustment are electrically controlled. 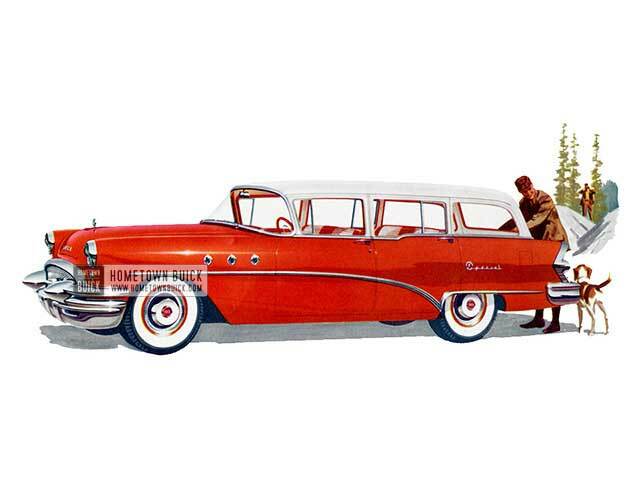 The 1955 Buick Roadmaster Sedan (Model 72) has a tapering new curve of rear window posts, plus a built-in sun visor up front and rain coves over all 4-doors. 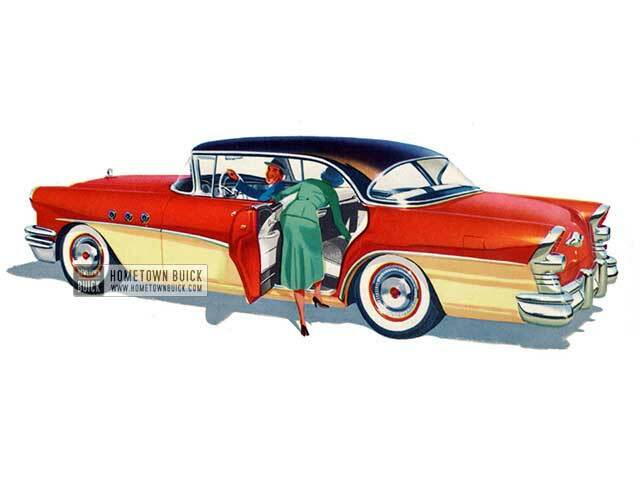 Included in Roadmaster price -ten luxurious upholstery choices for the Sedan and Riviera including gold- and silver-brocaded fabrics, plus Variable Pitch Dynaflow and Buick Safety Power Steering, back-up lights, brake warning light, electric clock, windshield washer and custom wheel covers. The distinguished 1955 Buick Roadmaster Convertible (Model 76C) offers such Roadmaster extras as choice of five different colors of leather upholstery, Redliner Speedometer, trip mileage indicator, double-depth foam rubber seat cushions plus electrically controlled windows and horizontal front-seat adjustment. 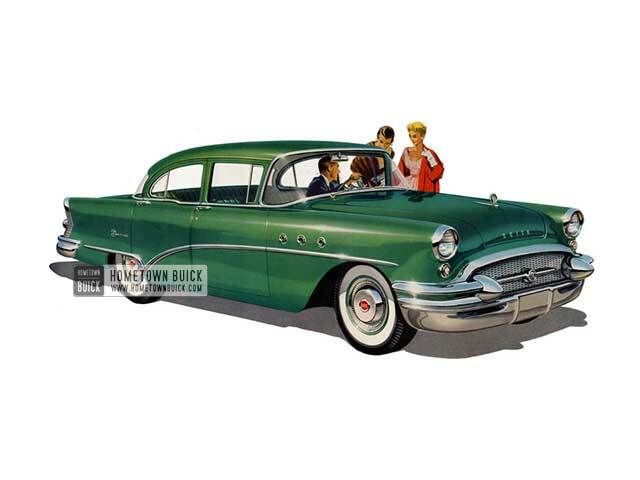 The 1955 Buick Super Sedan (Model 52) is the roomiest six-passenger Sedan in the industry. Front and rear seat hiproom, for example, measure 64.9 inches and 65.7 inches, respectively. Interiors are fitted out in lustrous nylon and rich cordaveen. For a touch of exterior beauty, note the new rear windshield treatment and swept-back front wheel cut. Note also the built-in sun visor and rain coves. 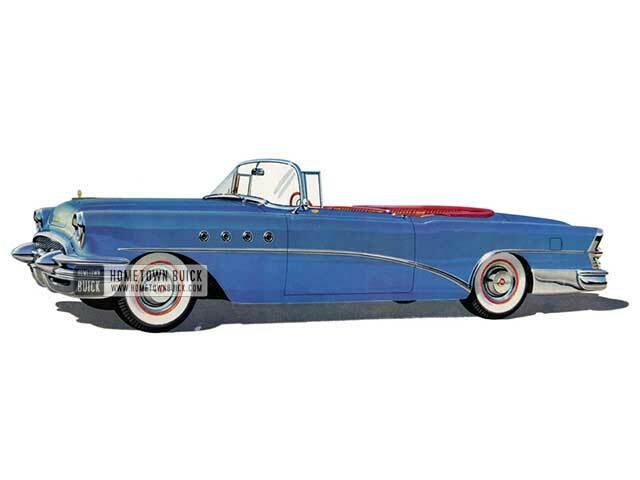 The 1955 Buick Super Convertible (Model 56C) brings you such Super extras as Buick's gas-saving 4-Barrel Airpower Carburetor-Safety Power Steering-foam rubber seat cushions-Redliner Speedometer-trip mileage indicator-jeweled electric clock. In addition. this Convertible's windows and horizontal front-seat adjustment are electrically controlled. 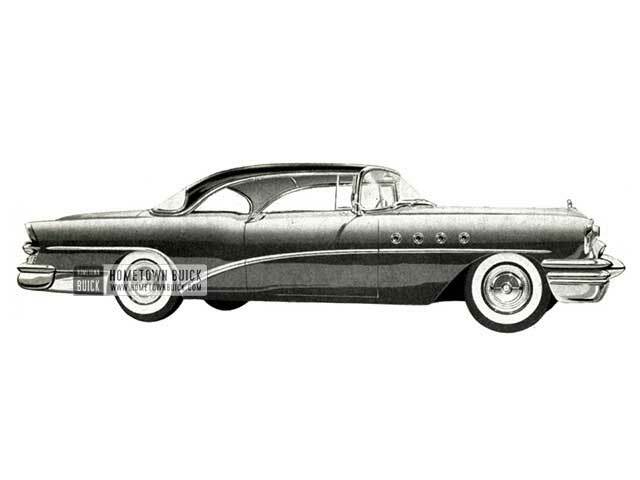 The sports-car-styled 1955 Buick Century Riviera (Model 66R) packs Buick's mightiest V8 engine-236 horsepower-on Buick's most compact wheelbase of 122 inches-and delivers just above Buick's lowest prices. Thus, the Century offers you the highest-horsepower-per-dollar of any car in America today. 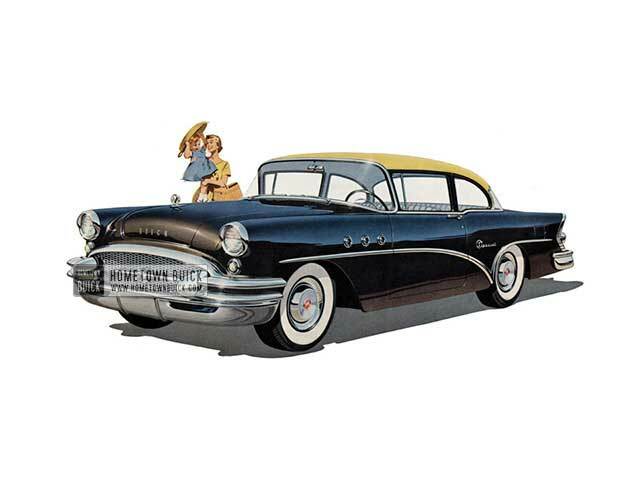 One glance tells the whole thrilling story... Buick's ever-popular four-door sedan and Buick exclusive Riviera styling have been united in one delightful new style setter, the 1955 Buick Century Riviera Sedan (Model 63). This is the car that America ordered-the added comfort, spaciousness, and convenience of four-door body construction with the open-air flair of hardtop styling. 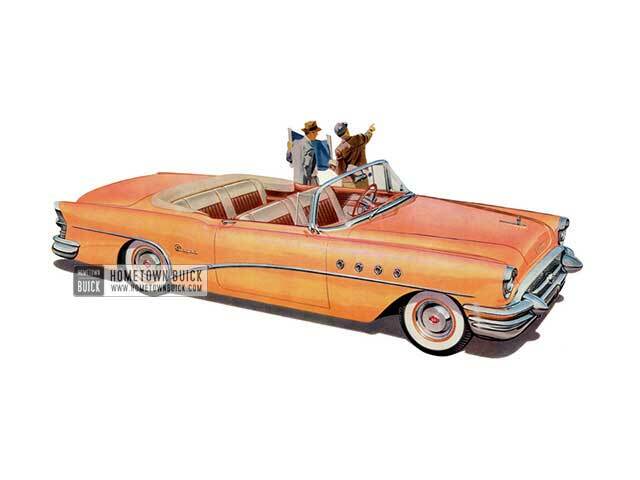 You'll find this roomy 1955 Buick Century Sedan (Model 61) is as level-riding as it is powerful. And the thrills of handling it-especially with Variable Pitch Dynaflow- can be known only by experience. Included in Century price: Redliner Speedometer and trip mileage indicator, new gas-saving 4-Barrel Airpower Carburetor, Foamtex rubber seat cushions, and jeweled electric clock. This smartly styled 1955 Buick Century Estate Wagon (Model 69) is available in the brilliantly performing 236-horsepower Century edition. It is abundantly roomy and serenely level-riding. It has fully carpeted front and rear compartments. Here, on an easily maneuverable 122-in. wheelbase, is Buick's famous 1955 Buick Special Estate Wagon (Model 49), in the solidity and lasting beauty of an all-steel body-and-at a new, lower price. With its great new 188-horsepower V8 engine, abundant roominess and serenely level ride, this Special Estate Wagon is your smartest buy in double-duty travelers. This model may be ordered with a split rear seat which can be folded away in sections, thus giving deeper loading space and rear seating space at the same time. 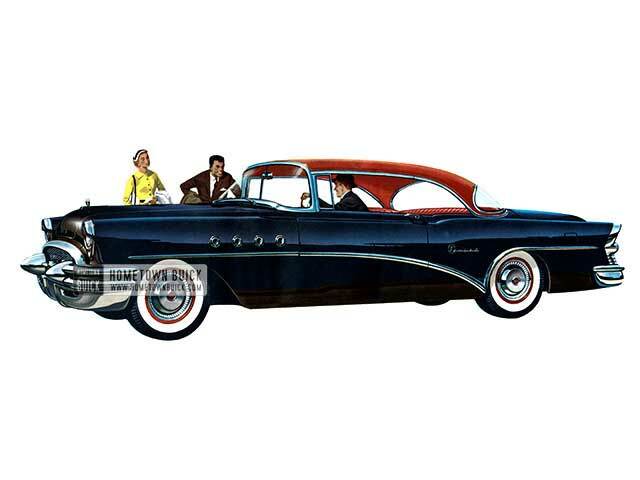 It's 1955 Buick Special Riviera Sedan (Model 43), the newest thing on the road, and a beautiful new body style that will again set the pattern for years to come. It's a thrilling new Buick, with the highest horsepower in Buick history coupled to a complete new transmission, Variable Pitch Dynaflow. The horsepower in the Special powers this Buick along in a more efficient, economical, and soul-satisfying way than you have ever known in a previous model. The new Variable Pitch Dynaflow brings even more of an exciting change than the new horsepower. Swift, immediate-yet silken smooth response to accelerator pressure, makes you the easy master of the road over every traffic situation. 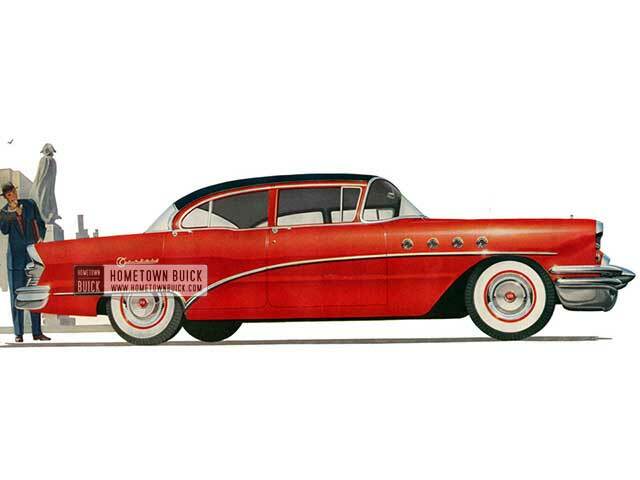 These are only two of the sweeping 1955 Buick changes that set this thrilling automobile apart from everything on the road. There's a new Four Door Riviera coming soon to your Buick dealer's. Visit him and take a look. Your heart will do the rest. Stepping out with new verve in '55, this powerful 1955 Buick Century Convertible (Model 66C) has a sleek, low style look coming and going. Interiors of all Centuries are of a custom quality high above their modest cost. Windows and horizontal front-seat adjustment in the Convertible are electrically operated and its leather upholstery comes in your choice of 5 color combinations. 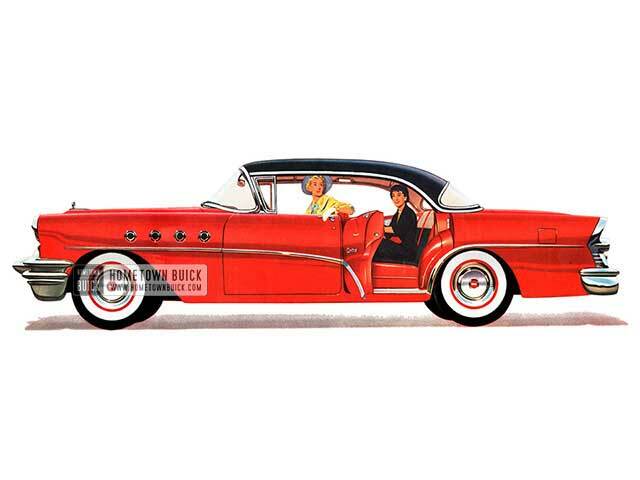 Here, in this budget-priced 1955 Buick Special Convertible (Model 46C), are racy, lower lines of fenders and hood-new visored headlamps and taillights - Buick's High-Air Intake Ventilation and aircraft-type instrument panel. Seats are deep, wide and upholstered in beautiful cordaveen. 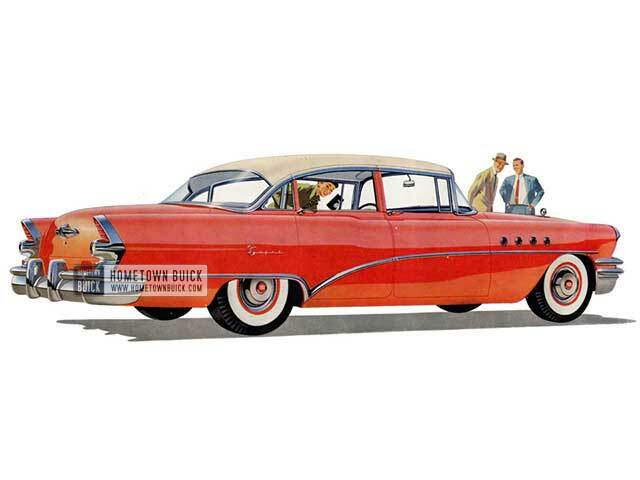 Sports-car look of the 1955 Buick Special 2-door Sedan (Model 48) is highlighted by fully exposed wheels. Included in Special's bedrock price: Direction signals, side armrests front and rear, sliding sunshades, StepOn self-locking parking brake, heavy insulation against heat and sound. 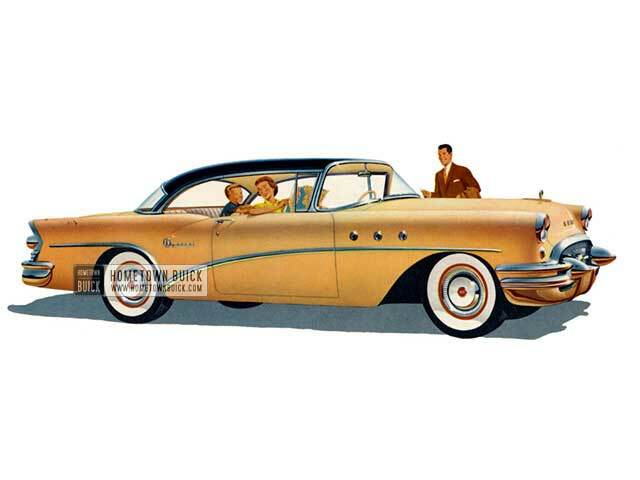 1955 Buick Special Riviera (Model 46R) prices start just a few dollars over America's lowest. There the similarity ends. For in this lively Riviera-and in all Specials - there's high-fashion Buick beauty- solid Buick value in ride, and roominess-sparkling performance with a new 188-horsepower V8 engine. 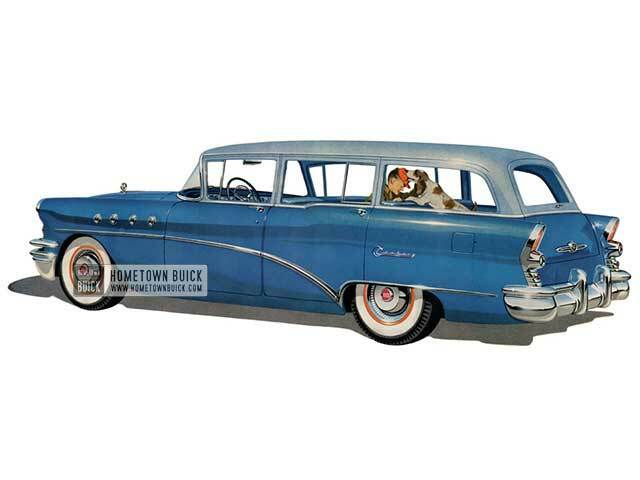 This roomy 1955 Buick Special Sedan (Model 41) comes delivered at a surprisingly low price for 1955. 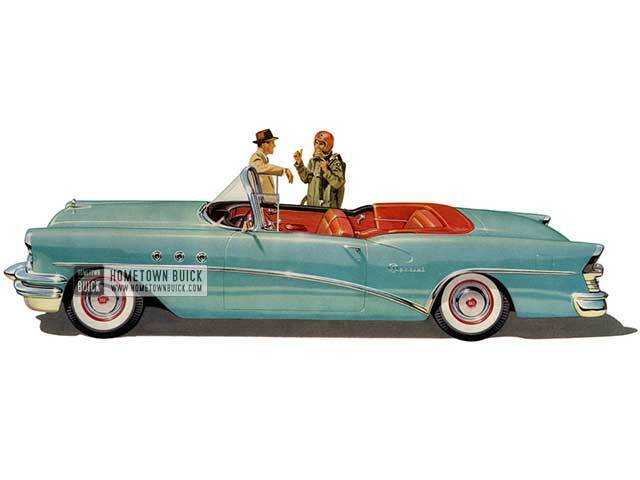 Your Special can be equipped with such optional Buick features as Variable Pitch Dynaflow. 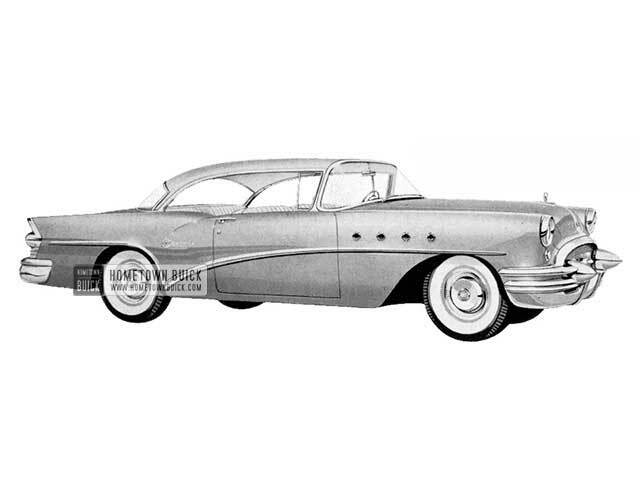 Buick Safety Power Steering, Improved Power Brakes, Redliner Speedometer and trip mileage indicator-even Buick's draft-free Airconditioner (in the 4-Door Sedan and Riviera).